Cotaage Sofia is situated in the entrance to the valley Demanovska dolina, one of the most visited place in Slovakia … More » . 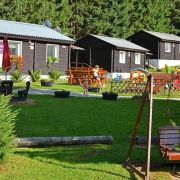 It is situated 6km from the biggest ski resort Jasna and 5 km from the centre of town Liptovsky Mikulas. Accommodation in Slovakia – in Liptov, close to the thermal Aquapark Tatralandia, skiing in the ski resort Jasná … More » Nízke Tatry – Chopok and Ski Park Ružomberok, Bešenová. 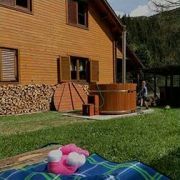 accommodation Aqautherm cottage, cottages and cabins near the aquapark Tatralandia, hiking, holiday, skiing. Effectively furnished, reconstructed bungalows with 2, 4 and 5- beds, separate entrance, separate bedrooms with … More » 2 beds, bathroom with shower (towels), WC, kitchenette - complete equipped, TV/SAT, in 4-5-beds bungalow also living room with a 5th bed + extra bed,safe ,parking in front of bungalow. 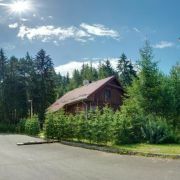 Our chalets are located in Great Fatra Mountains, 400m away Liptovské Revúce village - Nižná is a quiet locality … More » , in the heart of nature with creek. Connect with the nature, not WIFI. 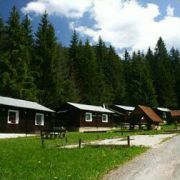 The chalet Medveď can accommodate up to 12 guests, the chalet Jeleň up to 8 guests. Wood fired outdoor bathtub. 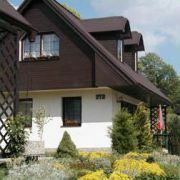 Cottage in the picturesque village under Gerlachovský štít offers all year round accommodation with a total capacity … More » of 51 beds. The cottage has 2 floors and ground floor, with separate entrance for each floor. 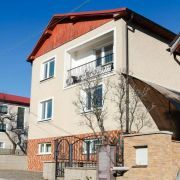 There are apartments on the ground floor, rooms are situated on the 1st and 2nd floor.